In their bid to become a truly international centre of the highest standard, the Singapore Turf Club inaugurated the S$3 million Singapore Airlines International Cup in conjunction with the official opening of the state-of-the-art Kranji Racecourse in March, 2000. Entries were invited from horses throughout the globe and the final selections pitted six Singapore based against eight from overseas, headed by Hong Kong Cup winner JIM AND TONIC from France. In the truly exciting contest, local champion OUZO, ridden by J Saimee, just edged out Jim And Tonic. The 2nd edition saw England's ENDLESS HALL defeating Jim And Tonic and WITH THE FLOW in an all-European finish in course record time. In 2002, the powerful Godolphin Stable captured the prize for the first time when GRANDERA easily beat German entry PAOLINI. The race was not held in 2003 because of the outbreak of the SARS virus. German horse EAPLO scored a runaway win in 2004 and MUMMIFY scored a 'first' for Australia in 2005. COSMO BULK and SHADOW GATE gave Japan consecutive victories in 2006 and 2007. South African scored a 'first' in 2008 while it was Brazil's turn in 2009 with GLORIA DE CAMPEAO. 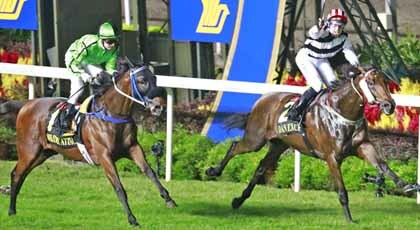 Hong Kong horses won in three consecutive years from 2013. The Singapore Turf Club decided to discontinue the Cup from 2016.